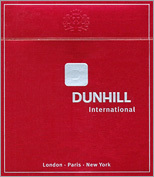 Dunhill Cigarettes Online for Australian customers! Dunhill cigarettes are manufactured in Eastern Europe under the license and control of British American Tobacco based in United Kingdom. The smell of fresh tobacco and exclusive taste brought a great popularity to this brand. It comprises a variety of selected tobacco sorts, which gives a sweet and spicy flavor to these cigarettes. The real tobacco is a prerequisite of Dunhill blend. You will find no chemicals and additives in these cigarettes. Its rich aroma will make you feel completely detached from the earth. The purity of tobacco is the main trait of this brand. Dunhill is "Internationally acknowledged to be the finest cigarette in the world." and on merit is called premium cigarettes brand. It is produced from the best Virginia tobacco and inveterate smokers appreciate its gentle aroma especially because of lack of chemicals that are an essential ingredient used in every cigarette manufacturing process. It is difficult to stay stuck to one specific type of Dunhill cigarettes. Each of them has an amazing flavor with notes of coolness. We offer you a great opportunity to experiment with different tastes depending on your mood and life style!